Williams Digital Pianos is known to produce quality digital pianos that are equally suited for both beginners and professionals. However, unlike other brands, Williams continues to focus only on crafting beautiful and dependable digital pianos, trying to perfect the instrument. They do not seem to be concerned about carving out a place in other niches, and continue to hold fort against the larger and more popular brand names such as Yamaha, Casio and Korg. Williams Legato is their entry-level, very affordable digital piano that continues to feature prominently in almost all the major Top 10 lists of best digital pianos in 2015. With a full range of octaves and 88-keys, the Williams Legato 88-Key Digital Piano aims to provide its users an authentic piano playing experience but at the same time avoids weighing heavily on the budget. A price tag of under $200 has worked wonderfully in favour of the Williams Legato and it continues to be the #1 Best-seller on Amazon in the digital pianos category. Does the Williams Legato actually have a performance level to justify its presence in so many Top 10 lists, or is it only because of its extremely affordable price tag? Find out in our review below. 1) Piano Style Semi-Weighted 88 Keys – The Williams Legato features a full range of 88-keys, that are “semi-weighted” to reproduce the touch and feel of playing a real, acoustic piano. Certainly not the best feature present on the Legato, the piano keys are definitely not bad to play with and offer a fair ability to play piano notes with expression. Most of the under $200 pianos feature a sub-standard 61-key layout with at most 5 or 6 octaves, which means they do not have the ability to play certain songs (especially duets). 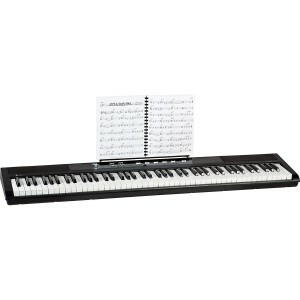 Whereas Williams Legato’s full range of keys and octaves allows you to tackle any kind of music. However, it does lack the now common “Graded Hammer Action” in the piano keys, which is definitely a downer. 2) Five Built-In Piano Sounds – There are five different sounds (Piano, Electric Piano, Synth, Organ and Bass) built in to the Williams Legato, which admittedly is a slightly limiting factor for its piano playing capability. However, there are Dual and Split layer modes available, which somewhat negate this limitation. Using the Dual layer mode, players can combine two different sounds to produce a distinctive piano tone, whereas the Split Layer mode enables the keyboard to be halved with separate tones assigned to each of the sides.There is also a music library included, with 5 pre-set songs that can be used for learning and practice. 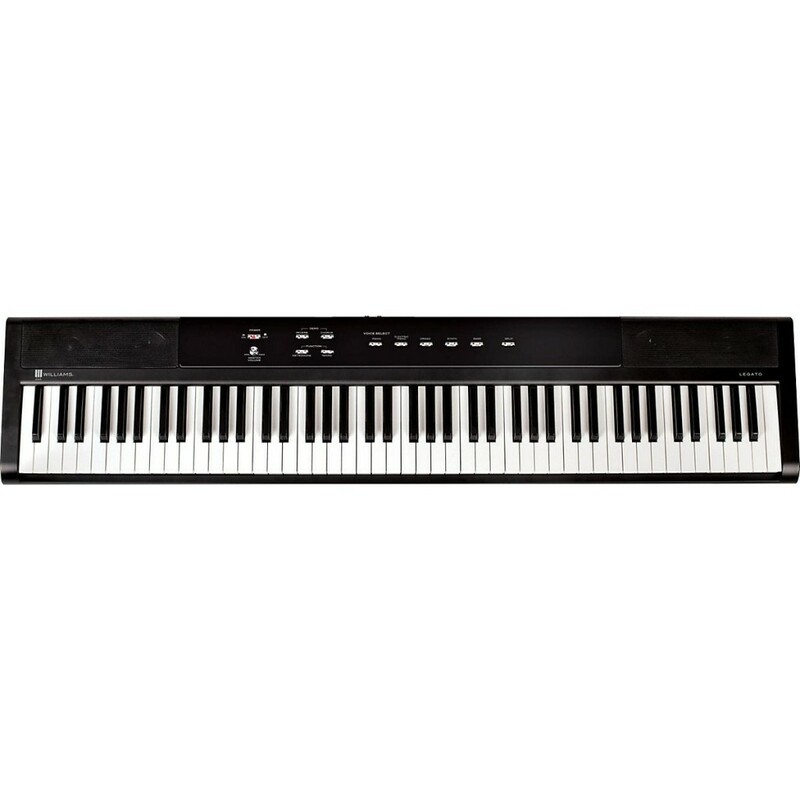 3) 32-Note Polyphony – Like most of the entry level digital pianos out there, including the very successful Yamaha P35, Legato too, offers a maximum 32 note polyphony. While this range is sufficient to add that touch of versatility in your performance and ensures that the major chords are played out smoothly, the Legato is bound to be found lacking when using the sustain pedal heavily. It should be made clear though, that the overall sound quality of the Williams Legato is definitely not sounding and is quite close to a professional piano. 4) Reverb & Chorus Effects – In order to further perfect your piano performance, the Williams Legato provides Reverb and Chorus effects that can be applied to each of the piano sounds individually and stored for further use. Also, even if you switch off the digital piano, the Reverbs and Chorus that you applied to a piano sound, will continue to remain stored in the piano until you remove them. These effects allow you to customize your music for a more natural and complete feel. You can turn off the Reverb and Chorus effects by pressing the “Effect” button down till the LED light turns off. 5) USB Connectivity – Williams Legato can be connected to other devices such as computers and smartphones, for educational and recreational purposes. You can also easily transfer your sound files from the piano to your computer and use it to save your compositions or use a VST to replace the existing piano sounds, further opening up new possibilities for creating music! The Legato is also capable of acting as a MIDI controller and can operate over 16 channels at the same time, while receiving MIDI info. 6) Battery Enabled Power Supply – The Legato runs on six batteries, which is an excellent feature for people who are looking for a completely portable piano (the Legato is super light too, at merely 19 pounds). Those who want a plug-in cord though, will have to purchase it separately as part of a ESS1 pack, which also contains a sustain pedal and a music stand, all at $30. This feature might be off putting for some understandably, but one should remember that the objective of Legato was to provide a supremely portable digital piano, at under $200. 7) Additional Features – There is a built-in speaker system of 2x 10W speakers, which is powerful enough to cover a large room. In case you want to amplify the piano sound further, you get the option of plugging in an external amplifier too. There is a headphone jack available too in the Williams Legato, which enables you to practice without any external disturbance. The “cons” for Williams Legato are ample, but they are all easily overshadowed by the piano’s incredibly cheap price tag and other unique features in its category such as 88-key layout, USB connectivity and Dual & Split layer modes. Williams has hit the nail on the head by keeping the price tag below $200, which has allowed a larger number of population to attach and get accustomed to this otherwise high priced segment. Go for the Williams Legato if you are a music enthusiast looking for a budget friendly piano or a teacher looking for a suitable piano to teach their students at home. The Legato offers close to real piano experience at a great price and is capable of producing many quality hours of piano learning and playing.